AMC Theatres offers custom gift cards for sale in their online store. 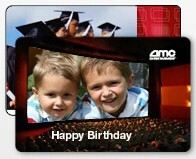 You can choose between a traditional design or add a photo to create your own custom AMC Theatres gift card. With the traditional AMC designs you are unable to add your own photo but the gift card can still be customized by writing a personal message. The personal message will appear at the bottom of the gift card. The second type of personalized AMC Theatres gift card allows you to upload any photo which is then integrated with an AMC Design, for example you can upload a photo of your friend and it will appear on a movie theater screen within the gift card. In addition to uploading a photo the personalized AMC Theatre gift card can also include a short message. The traditional AMC gift card with a personal message does not have any additional fees. The personalized AMC gift cards costs $4.50 which includes the card processing, printing and card carrier fees. If you sign up for or are already signed up for the Target baby registry you will receive a free $20 gift card which can be applied towards any purchase at Target. 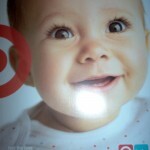 The card came attached to the most recent edition of the Target baby registry catalog. There are a number of annoying conditions that come with the gift card, but as long as you plan on using the $20 Target gift card towards an in store purchase you should not have any trouble redeeming it. To redeem the card you must bring it to a Target store, sign up for a baby registry, and the gift card can not be used towards another gift card. Its nice to see retailers giving back to their customers, even if it is spurred on by their desperation during the recession. With the closing of all Outback Steakhouse restaurants in Ontario thousands of consumers have been left wondering if their gift cards are worth anything. Outback closed the doors of its nine Ontario restaurants in early March. Often when a chain goes under consumers still holding gift cards are left to foot the bill, luckily Outback Steakhouse’s Ontario management firm has devised a reasonable alternative for those still holding Outback Steakhouse gift cards. Giftah is please to announce that Outback Steakhouse gift certificates and gift cards issued for Outback Ontario steakhouses can still be redeemed at any SIR Corp. restaurant which include popular restaurants such as Jack Astor’s, Canyon Creek and Alice Fazooli’s. Giftah will continue to allow the trade of Outback Steakhouse gift cards as they are still valid at alternative restaurants and the Outback Steakhouse chain continues to operate in Alberta, Canada.